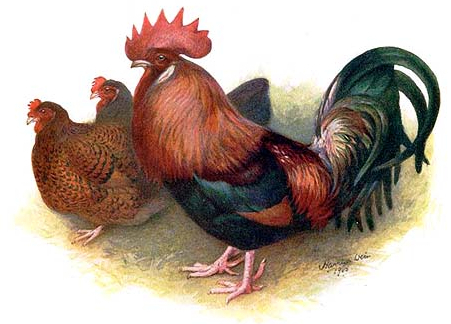 Vintage colored book plate of a red Dorking chicken. This beautiful drawing is the work of the well-known 19th century illustrator Harrison Weir (1824-1906). It was included in the 1902 work Our Birds. We are lucky to have found several of these Dorking chicken drawings that he had done. This one shows a trio of birds. The rooster appears to be protecting two hens from us. With his long flowing tail feathers, red upright comb and iridescent feathers, he must really be something to see in real life. This dramatic chicken drawing, like all of our bird images is in the public domain.